This National Tree Day July 29 – plant Carobs with Currajong! Deb Hewitt and Neil Unger of Currajong with Thomas Ellison planting trees. Last year Currajong planted 500 jujubes in addition to the carob trees currently planted. 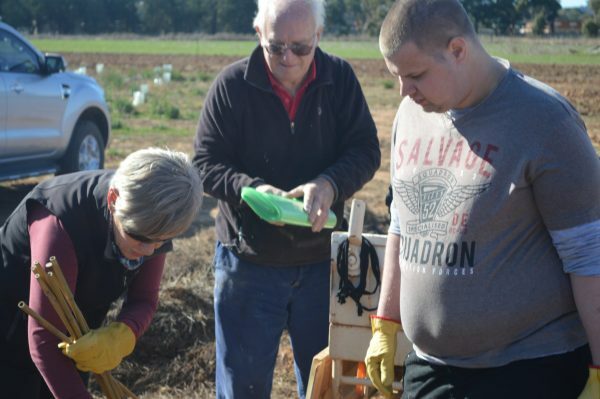 WITH National Tree Day being run and held at Akuna Road this Sunday July 29 from 10am what better time to partner up with Currajong Disability Services as they branch out into the Carob Tree business? Not only would you be doing your part for the environment and providing fodder for cattle in these dry times but you could also potentially make a windfall. It is the little known product that could create a great impact on the Australian agricultural industry and provide revenue for many groups that may not have normally benefited from it. Carob is a beneficial type of shrub in the same family as peas that have a wide variety of health benefits, including its ability to boost the immune system, reduce the risk of cancer, improve digestion, slow down ageing, prevent cardiovascular diseases, and manage diabetes. According to Ogranic Facts, Carob, also known as St. John’s-bread, is a member of the Fabaceae family, so the edible fruits are considered legumes, like peas. The fruit comes in a pod, much like peas, and they grow in a cylindrical shape supported by a thick trunk, from which the pods grow. The plant is native to the Mediterranean region and Northern Africa, as well as parts of the Indian subcontinent and Asia, all the way to Macaronesia. Many cultures regularly use carobs like other nuts and seeds, and also as a substitute for chocolate! The health benefits of carobs are mainly attributed to their vitamin and mineral content, like calcium, zinc, potassium, phosphorus, vitamin K, riboflavin, and vitamin E, as well as its natural antioxidants. Yet there’s only one problem – no one knows about just how useful they really are. Neil Unger, Chairman of Currajong Disability Services who has spent his life on the land, is on a mission to change that and educate the masses on the numerous advantages carobs provide. “The biggest issue facing the industry is getting the message out there,” said Neil. “Carob is drought proof, can grow on free draining soil, slightly salt tolerant and feeds stock for free. “Not to mention the numerous health benefits for people,” he said. Yet for Neil and Currajong to take the next step in the carob production business they need your help. “We are a niche NDIS service provider in Central West NSW and we see carobs as an investment to generate revenue for our not-for-profit organisation,” he said. “To do that we need assistance from farmers who have some acreage to grow carobs. “We can’t do it alone and we are happy to share the windfalls and successes that come with it,” Neil said. The value of carobs doesn’t just lie in food and health but also seeds, pods and trees – something that every person who works on the land should take stock of. “Carob is an amazing legume but the masses aren’t aware of just how incredible it is,” said Neil. “My mission is to change that and to make carob a viable alternative in the agriculture and health industries.